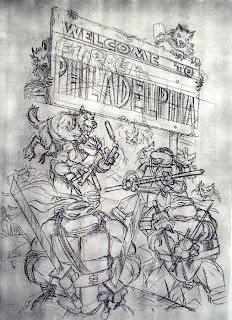 Hi Peter--Just to satisfy my curiosity, did you do the pencils then lightbox it to ink, so you have originals of the pencils and inks? Or did you scan the pencils to archive them, then ink over the art? I ask because you seem to have retained a lot of your pencil art. Whereas I, because I ink directly over them and have never thought to preserve them, have almost none. Hey, Stan! Good to hear from you. Regarding the copies of pencils: Probably about five or six years ago, I started doing most of my penciling -- at least anything that I planned to ink myself -- in photoblue pencil. I think it was because I got tired of all the erasing that I had to do after I finished inking, and possibly because the ink laid down by some of the inking tools I was using at the time didn't stand up well to vigorous erasing. As you are probably aware, photoblue pencil lines don't show up well, if at all, when Xeroxed. I mean, that's the way they're supposed to work, right? But it makes it kind of a pain if you want to archive a copy of those pencils. One day I got an idea -- if this shade of blue made by the photoblue pencil is more or less invisible to the copier's scanning hardware, what if I fooled the copier into seeing it as another color... like green? So I bought a sheet of transparent yellow plastic, laid it over the blue-penciled artwork, and it worked like a charm. The copies came out looking as if the pencil drawing had been done with a standard black pencil. I think I probably try to copy most things that I pencil (not that much these days) because I like to have a record of the original work. Sometimes the pencil drawing is nicer than the eventual inked version. Thanks for the clarification. I had never heard of using a yellow filter to fool the camera. That is ingenious. I still use graphite pencils and erase. I used to pay my kids to erase my art, but they hate it more than I do. Any chance of you guys going to the Baltimore Con in October? I'm planning on being there. I agree with Mr. Sakai. The idea to use a yellow filter to make the blue pencils visible to a scanner is very clever. I think it's a good thing to record the original art. It would be a shame if it got lost forever. Mr. Sakai, would you consider going to the Boston Con. I don't know if the Mirage group is planning on going again this year, but I am pretty sure they were there last year. And I would love the chance to meet you in Boston this year. Boston Con? Is that the one the first week in April? If so, I will be at the Emerald City Con in Seattle, then Hawaii for Kawaii-Kon the week after. I'm finding out as well, that sometimes the pencil drawing just looks 'cooler', for lack of a better word, than the final inked drawing. I recently colored all of my original character design temp sketches (awaiting re-imagining by a real artist) and on more than a few I wish I Had saved the pencil copy and not inked over it.. I showed these to Murphy to get opinions on wether or not the faces looked too similair, since I knew the bodies sucked...but I really wish I had kept the pencil versions to show, since I think they looked better.. Boy, it's tough developing a series. I don't know how you and stan did it and remained sane with all the ever changing ideas I Have :). PS, I guess the links will have to be copy and pasted. I don't know why Blogger doesn't automatically make them click able..thanks :). "Boston Con? Is that the one the first week in April? If so, I will be at the Emerald City Con in Seattle, then Hawaii for Kawaii-Kon the week after." -->> .. the Copies of the Copies.. also make them look much more dated and cool. 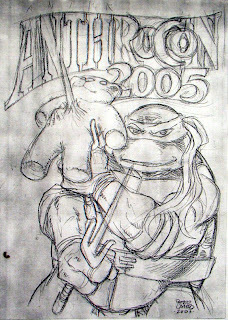 -->> .. this work is also reminiscent to the ' Furrier ' characters in the old Palladium TMNT Adventures RPG books.